I am an afficianado of the beautiful ancient Asian game of go. I consider myself a rank beginner (20 kyu), but a big fan of the game just the same. Below are pictures of the go equipment I own. All of it was purchased at Samarkand, which is also where the pictures come from. If you love go, then you absolutely must check them out. They have some of the finest go equipment you will find anywhere in the U.S.
To the left is a picture of what my Agathis table board looks like. The bowls pictured with the board are not the bowls I have. To the right is a picture of the bowls I have. 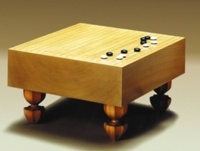 This magnificent Katsura floor board is the go board I'd like to own someday. At a mere $1200 (for a 6.5" board), it doesn't bestow nearly as much prestige as a genuine Kaya floor board, but I'm not enough of a go fanatic yet to spend over $6000 just for a board! And here are the bowls I'd like to own someday. Are they gorgeous or what! 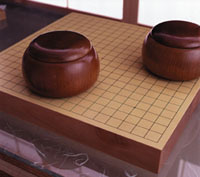 At $450 a pair, they don't get any finer unless you are willing to pay $1350 for a pair of genuine Kaya wood bowls. I have also recently become a fan of the game of Mah Jongg. I just love those tiles! I love their solid feel, the clattering sound they make when you shuffle them, the way they look when formed into the Wall, and the wonderful Asian artwork on each one. This is definitely a game for the sensualist! And it is a fun, addictive game to boot! 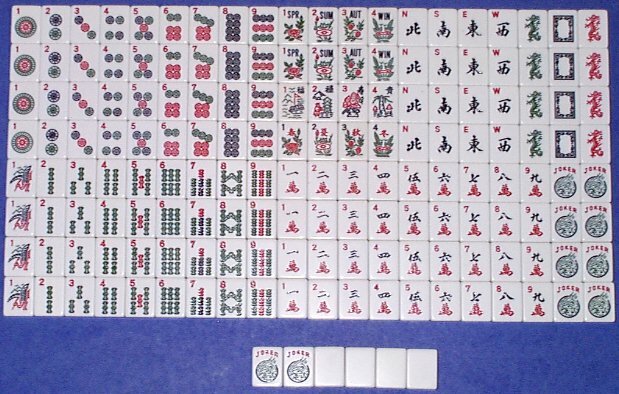 Below is a picture of the tile set I have. It is a full 160-tile set, plus a few spares. Click on the image to see a (much) larger view. 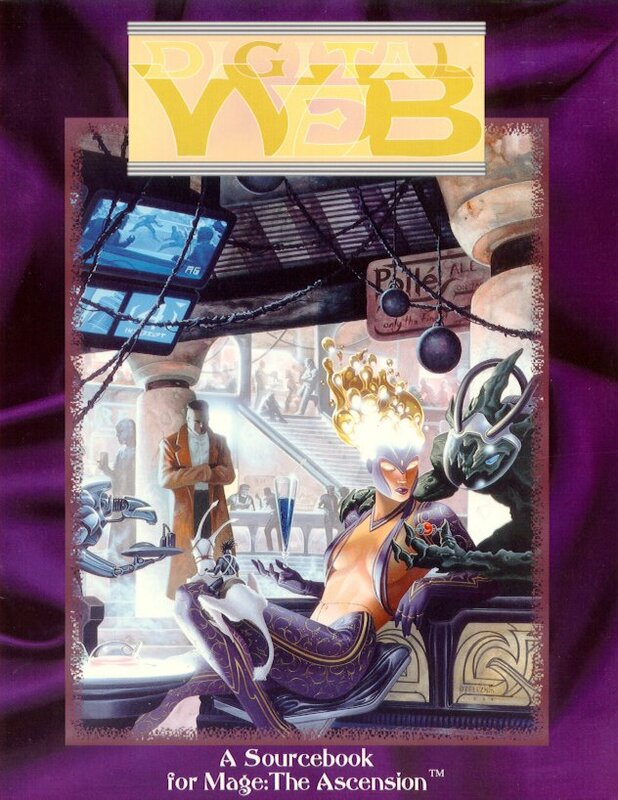 Here's the part where I shamelessly mention the stuff I wrote for White Wolf Game Studio in the early 90s as a freelancer. That was a short-lived career, mostly because I discovered that even though I loved playing RPGs, I hated writing for them. It just wasn't fun. And it certainly didn't pay very well. 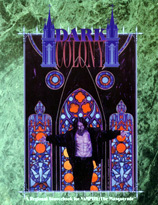 I co-wrote Dark Colony and wrote an adventure for Digital Web. 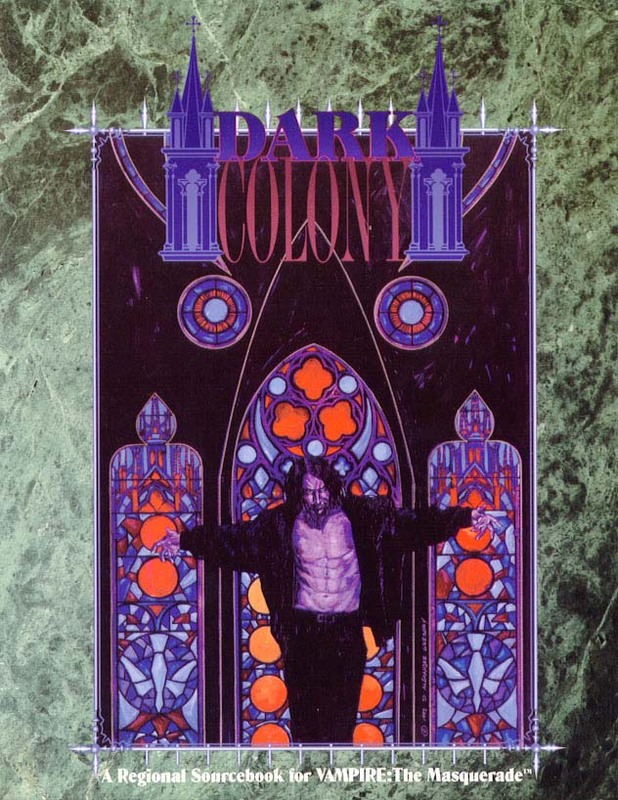 Click on them to see larger images of the book covers. If you are an hobbyist wargame designer like me, you probably know how hard it is to find wargame terrain graphics for use in making your own mapboards. Well, I took the time to scan the Letratone sheets that have the good old traditional wargame terrain graphics you've seen on countless wargames from the 70s and 80s, and have turned them into simple black & white, repeating tiles that you can use in any common graphics program. I have scanned five different terrain types (woods, light woods, mountain, rough, and swamp), each in three different resolutions (72dpi, 180dpi, and 300dpi). Each tile is approximately 3.5 inches on a side and is a repeating texture in TIFF format. There are five ZIP archives here for you to download, one for each terrain type. Each archive contains all three resolutions of that particular terrain. Color Counters for Lou Coatney's MOSCOW ATTACKED! Here you can find color counters for Lou Coutney's free downloadable wargame Moscow Attacked! These counters were produced with Lou's approval. Download them and enjoy! Here you can find color counters for Lou Coutney's free downloadable wargame The Russian Portfolio. These counters were also produced with Lou's approval. Download them and enjoy! Rival Game Labs Cool freeware PalmPilot applications for gaming (developed by yours truly). ASL Crossroads Excellent site for Advanced Squad Leader aficionados. Tuomoland Another site for Advanced Squad Leader players. Check out the primers on basic play. Web-Grognards The best wargaming hang-out on the web. Columbia Games Their wooden block wargames are absolutely wonderful. Hero Games Home of my all-time favorite RPG system, Champions®. TSR Inc. Home of the grand-daddy of all RPGs, Dungeons & Dragons®. CONSIM World It's back! The best place to find the latest wargaming industry news. U.S. Chess Federation If you are a chess fan, you should check out the U.S. Chess Federation web site. You can find all kinds of chess resources there. Space Vermin Home Page This is a small gaming club I used to belong to in MA. Dark Dungeons Page Yes this is the real McCoy. Yes, this really was published by Chick Publications back in the early 80's to scare good little Christian kids away from Dungeons & Dragons®. The Munchkin Page Here it is! The Munchkin Page (the long version).